Our Vision & Values are at the core of everything we do. They underpin our teaching and learning, and provide an environment which prepares our pupils as confident, happy citizens. 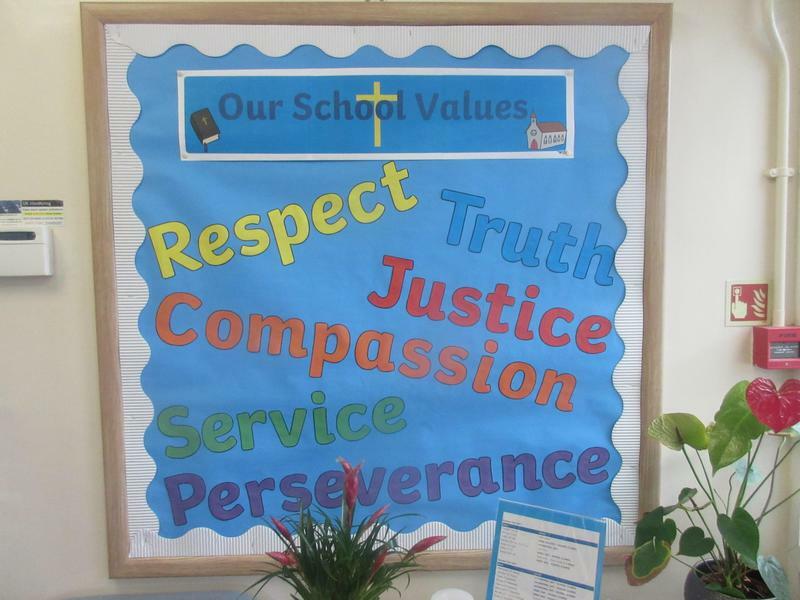 We have been learning about each of these values through Collective Worship, RE, PSHE and within the rest of the curriculum. We spend each half term studying a different value, starting with Respect. We hope that these can be seen in our lives both at home and at school and ask that parents help their children to follow them. To encourage the children to value themselves and to respect the beliefs, needs and feelings of others. To inspire children to think independently, to be positive in their outlook and to communicate well. To provide a safe and caring environment where achievements are celebrated and a sense of pride is encouraged. To develop in the children an appreciation of the beauty and wonder of God’s world. To provide a relevant curriculum for all children to help them develop their full academic potential. To foster in the children a sense of belonging to their local community and to widen their sense of responsibility in society.